It's no secret that I'm a book nerd. Like, a big one. So it was only a matter of time before I found a way to combine yoga and reading. These seven yoga poses are great if you don't want to lose your place, but want to get your practice in for the day. I hang out in Sphinx Pose all the time when I'm reading. That small backbend feels so yummy when you're immersed in a good story. Lie on your belly with your book in front of you, and bring your forearms to the ground so that your elbows are directly under your shoulders. Inhale the shoulders up and down the back, and keep reading! Stay for 3-5 breaths, or as long as you feel comfortable if you're at a particularly juicy part. This is another favorite. I could stay here for hours and read, and read, and read. Find an empty wall space, and come to lie on your back. Scoot your bum close to the wall, and inhale your legs up above you, so that they're resting on the wall. Just be careful not to drop your book on your face. Lotus Pose, Easy Pose, Hero's Pose... almost any seated posture will do. 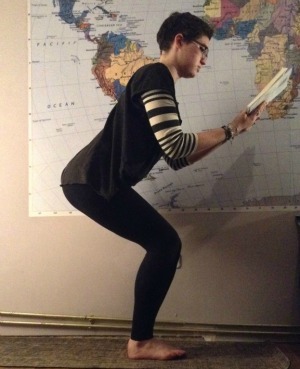 It's a classic reading pose! If you're choosing to read in Lotus Pose, come to a comfortable seat first. Gently take hold of one foot, and tuck it up into the opposite hip crease. Do the same with the opposite foot. If you feel any pain or stress in your knees, back off the pose, and go for Sukhasana instead. 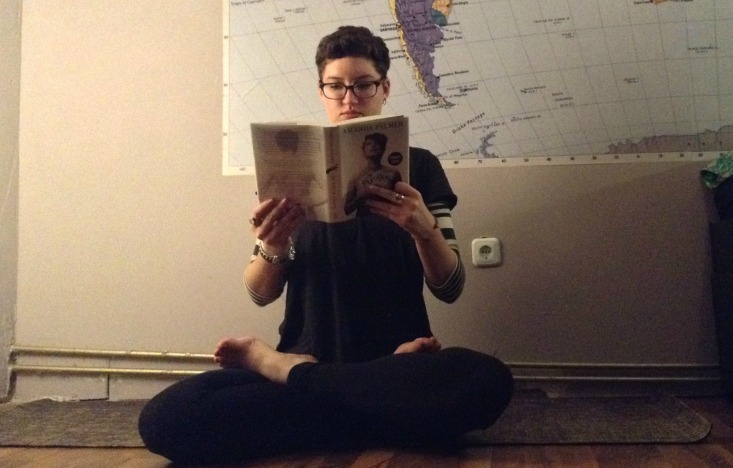 Reading is pretty much meditation, right? This is a kind of modified Child's Pose, so that you don't literally end up with your nose in a book. Start in Downward Facing Dog, with your book open on the ground. Gently bring your knees down the ground, and sit your hips back over your ankles. Get a good stretch in your arms, before bending the elbows and bringing your hands under your chin. Then get back to that awesome exposition! 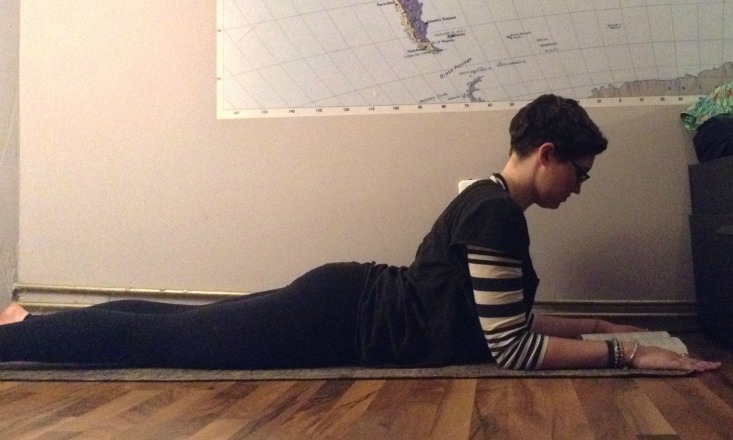 If you've been sitting in your favorite reading chair too long, and your hips feel tight, move into Frog Pose without whipping out your bookmark. Begin in Table Top Pose, and slowly walk your legs out from under your hips as far as you can go without straining. Your feet should be flexed with the inside edges of the feet on the floor. Gently come down to your forearms. Hang out here for a little while, either five breaths, or until the action subsides a little. Is it bedtime, but you just can't put your book down? I know that feel. Try out a Supine Twist, or as I like to call it, "I Should Stop Reading, But It's So Good, But I Should Really Put the Book Down" Pose. Get read-y (see what I did there? Hah!) to feel the burn! Without losing your place, come to Mountain Pose. Bring your big toes together, but keep the heels apart, as if you could fit a tiny piece of pizza between your feet. 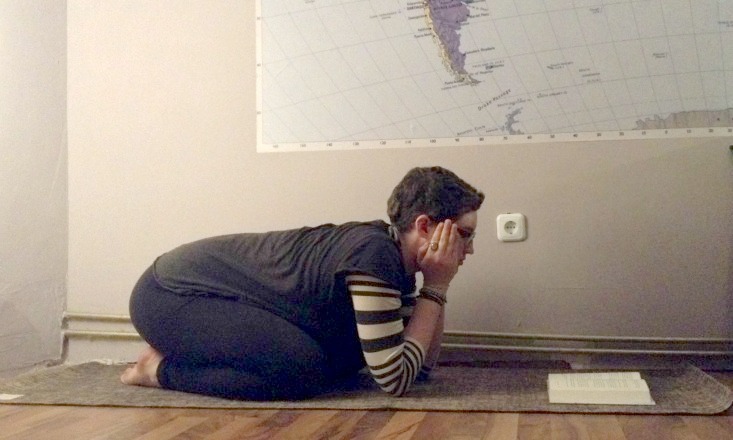 As you exhale, bend the knees as if you're trying to sit in a chair that isn't really there. Make sure you keep your knees in line with each other, so that one isn't moving in front of the other. Stay here until you feel the burn, or until someone takes pity on you and brings you a proper reading chair. 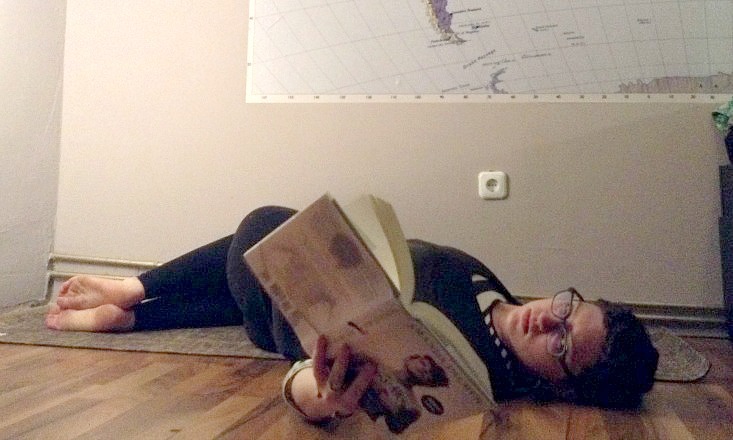 Have you tried any of these poses with a good book? 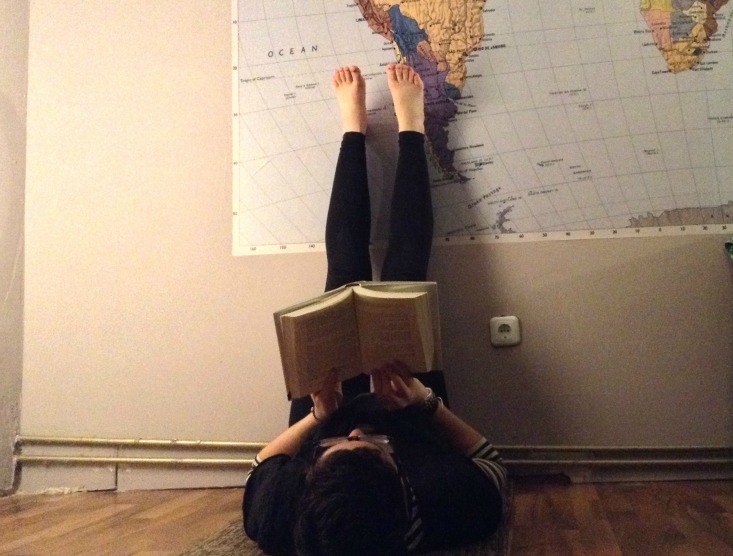 Or do you know any other yoga poses you can do while reading? Share with us below, and share your pictures with the community!